Last night was a very wild ride. The ride ended with me taking down the $300 buy in Super Monster on FanDuel for $250,000, capping off the biggest night of my Daily Fantasy career. Before I get into my actual lineup, I wanted to share the absolute craziness of the day that led to my win. 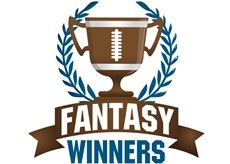 It had been awhile since I played daily fantasy baseball because I had spent most of last Friday and Saturday pumping out lineups for the huge fantasy football contests on DraftKings and FanDuel for Week 1 of the NFL season. On Sunday, I watched the games, and on Monday I took the day off so I could be fresh for the big baseball tournaments going on Tuesday. If you’ve been playing daily fantasy the past week, you have seen the massive overlays the big football tournaments had this weekend. 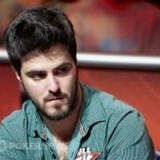 Most tournaments only got around 75% of the guaranteed entrants. What that means is that DraftKings and FanDuel (and even moreso other sites like StarStreet and FantasyDraft) had to add loads of money to the prize pool to reach their guarantees, meaning they were essentially paying you to enter the tournament. Both the $300 buy in, $1,000,000 guaranteed prize pool tournaments had about $100,000 in money added to the prize pool, meaning the expected value of an average entry in that tournament was $30, equivalent to a 10% return on investment, and that’s just if you had entries of average skill. On Tuesday, FanDuel decided to run two 1.5 million dollar guaranteed prize pool tournaments, one $25 Grand Slam and one $300 Super Monster. DraftKings decided to run a Millionaire Maker tournament, with a $20 buy in and $2,500,000 guaranteed prize pool, and of course $1,000,000 for first. By the beginning of the day it was clear to me that none of these tournaments were going to be even close to filling. The Super Monster ended up filling the most, about 80%. The Grand Slam had much more overlay, filling about $1,000,000 of the $1,500,000 guaranteed prize pool. That means FanDuel added almost $500,000 to the prize pool. Spread out among 41,000 entrants comes out to an expected value of over $10 per entry. However, DraftKings Millionaire Maker had the most impressive overlay. With only $1,823,000 in the prize pool compared to a $2,500,000 guarantee, DraftKings added $677,000 to the prizepool. The Daily Fantasy industry is becoming very competitive, and it seems as though the top sites will continue to guarantee huge prizepools at the risk of huge overlays. Look for tournaments like this consistently for weeks to come. Now, onto the strategy that helped me end up as the winner of the Super Monster! 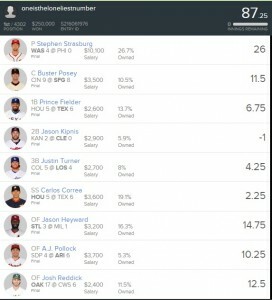 Seeing early on these tournaments were not going to come close to filling, I decide to focus on making a wide variety of MLB lineups, using many different pitchers and hitters, so I could hedge a lot of risk, allowing me to invest a lot more money without exposing myself to a lot of downside. If I had enough variety, some of my lineups would certainly do well enough with this massive overlay to get a breakeven or slightly losing day at worst. 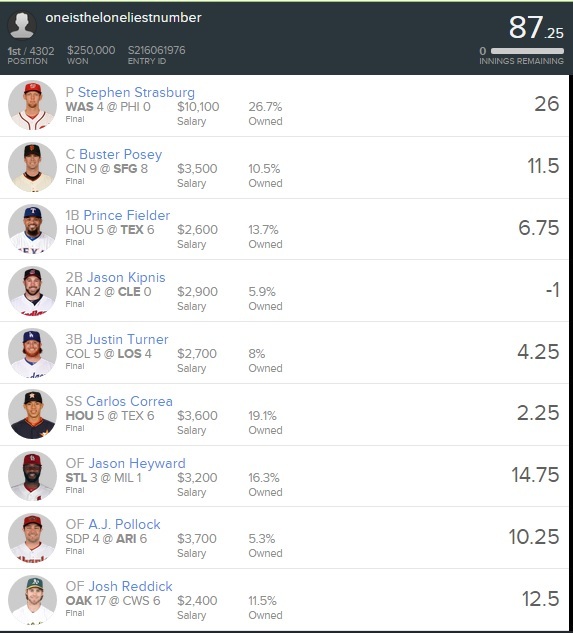 I ended up making around 75 lineups on FanDuel, while I got in about 150 lineups to DraftKings. Because of FanDuel’s flat payout structure on their big tournaments, I ended up entering the Grand Slam 500 times, about 7 times with each of my lineups. It was a risky move, but given the overlay it was a smart investment for sure. My two favorite pitchers of the day ended up being Carlos Martinez and Stephen Strasburg, and I probably ended up with too much exposure to both of them, which thankfully ended up working out. Carlos Martinez was very little used, but was on my radar from the start of the day. He had been throwing significantly harder in his past several starts, bringing his average fastball velocity just above 96 mph, which is a remarkably fast fastball. Velocity increases tend to be leading indicators of great performances. He also drew a surprisingly good matchup against the Brewers. The Brewers put out a lineup with a majority of right handed hitters, who Martinez tends to do very well against. They also had one of the highest strikeout, lowest pitches per plate appearance lineups of the day. Martinez had given up 3 earned runs or more in 6 straight starts, but his peripherals looked great, so I attributed his bad outings a lot to luck. Strasburg was a very highly used pitcher, and for good reason. He had the best SIERA in the last 5 games of any starting pitcher that day. His high velocity also matched up well against a low bat speed team like the Phillies. The lineup that ended up winning the Super Monster was actually the 2nd lineup I made, so it included most of my favorite plays of the day. The key to this lineup was good prices. The only two guys who were priced about right were A.J. Pollock and Carlos Correa. All the other hitters were much more skilled than their price suggested. I thought despite playing in the worst hitters park in baseball, Posey was the best option out of a lot of bad options at catcher. He was facing a fairly good pitcher but one that matched up well with Posey. Posey seems to feast off left handed pitchers who throw high in the strikezone, and John Lamb was exactly that pitcher. Posey hit a HR off of him in the 4th inning. There were a lot of good options at first base, but Fielder had the best price. He was also at a great hitters park and facing a pitcher who threw a lot of sliders, which is one of Fielder’s favorite pitches. Jason Kipnis didn’t have a lot going for him besides a very cheap price. He was facing a good pitcher, but he was at least at home in a good lefty park. He didn’t end up working out, but I feel good about the play. Justin Turner was just an underpriced guy, facing a bad pitcher, at his home ballpark. Carlos Correa was similar to Posey in the sense there were just almost no good plays at shortstop, so going to a good hitters park was enough for me to pick him. My outfield was what really won this thing. Jason Heyward and Josh Reddick were both significantly underpriced and going to great hitters parks. Heyward was also facing an extremely bad pitcher. I liked Pollock in a good stolen base matchup against Tyson Ross, who can’t hold baserunners well. He ended up stealing a base off of Ross, which validated my reasoning. Because I wagered a lot more money than I was really comfortable with, I ended up just turning off my phone after 4:05 and tried to just enjoy my night without a really stressful sweat. At about 9:10 I turned my phone back on and checked on the scores. I was having quite a good day, but not winning any tournaments. I looked at the DraftKings Millionaire Maker and saw that my roommate from freshman year of college and good friend Cy Watson was in 2nd! I called him up and just talked to him about how the night was going. He informed me he just needed Angel Pagan to double or better and he could possibly win a million dollars. He was understandably a bit freaked. 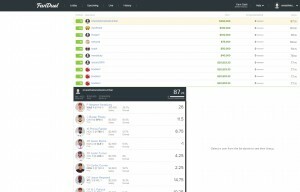 As I’m talking to him I have my FanDuel contest lobby up on my computer. Suddenly, my current winnings increased drastically, $250,000 to be exact. I paused for a bit not quite understanding what had just happened. After that, I just looked at my lineups in disbelief for a long time. It was about then I saw Angel Pagan was up to bat for the Giants. I heard Cy say that again in my mind before watching the plate appearance on the MLB At Bat app. There was no one on base and no out, and dialogue flashed across the screen after a few pitches. I went to DraftKings and looked. Sure enough, Cy had moved into first place in the Millionaire Maker. The games ended up going on to a painstaking 12:30 AM, when normally they end around 10:00 PM. Those last two and a half hours were truly dreadful, but both me and Cy held on for the biggest scores of our lives. This weekend I’m having my bachelor party in San Diego. It may be a little more extravagant than I originally planned. 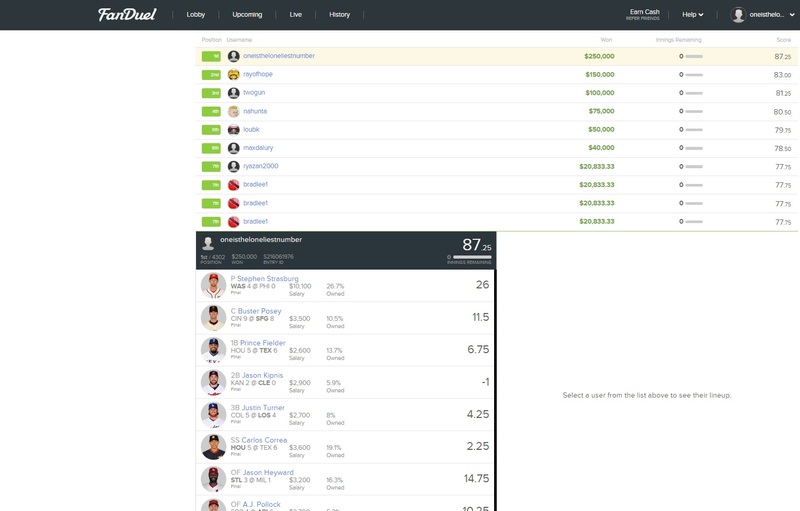 Interested in trying your hand at Daily Fantasy on FanDuel? Sign up through this link to receive a 100% deposit bonus up to $200! “Posey seems to feast off left handed pitchers who throw high in the strikezone, and John Lamb was exactly that pitcher. ” Can you explain how you came to the conclusion that Lamb throws high in the zone please? Thanks!